An indoor electric grill can do a lot of things to improve the quality of your cooking. Especially if you live in an apartment, condo, or townhome where outdoor grilling is banned. At the same time, an electric grill is also light enough that you can take it with you if you are camping or tailgating somewhere that provides access to electricity. 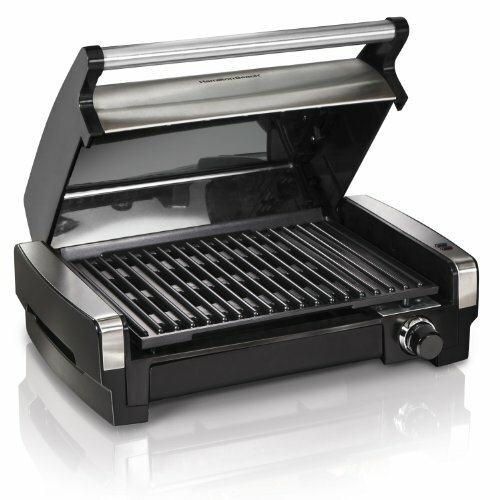 The Hamilton Beach 25360 Electric Indoor Searing Grill caters to people with these needs. It has a 118-square inch cooking grate that is perforated to mimic the lines and appearance of traditional grilled food. This also allows drippings to easily fall down into the large drip pan underneath. 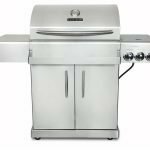 It makes it much easier to clean up than some of the competitor grills where grease and other drippings simply run off. The sensitive temperature control knob allows you to control the temperature throughout a wide range. This means you can go slow and low for something like a chicken breast or a deboned chicken thigh. Yet you can also crank it up to the maximum 450 degrees, which is hot enough to nicely mark a hamburger patty or sear a steak. The Hamilton Beach also knows that no one likes cleanup. With this in mind, they designed the Electric Indoor Searing Grill. The drip pan, grilling grate, and even the lid all easily detach from the base. They are also made from materials that are dishwasher safe. 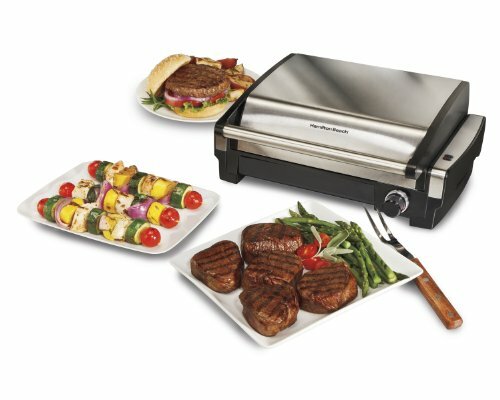 The Hamilton Beach Electric Indoor Searing Grill is very easy to assemble. You simply unpack it from the box and put it together. You barely even need to look at the instructions. It is made from quality materials, which includes a brushed metal lid. The large drip pan, grill grates and the lid easily detach from the base. 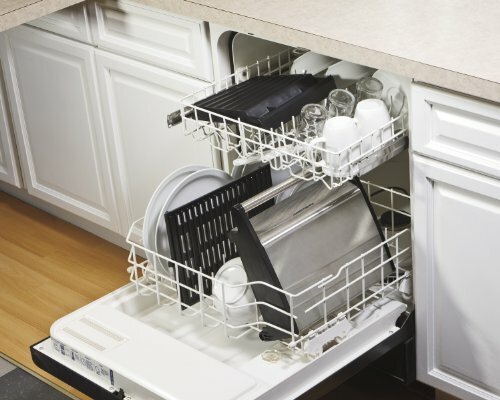 They are made from dishwasher safe materials, which make cleanup a breeze. Just keep in mind that these are the only things that are dishwasher safe. One knock on a lot of indoor electric grills is that they don’t get hot enough to create strong grill marks or develop a nice sear. The ones that do often end up getting too hot, to do anything other than sear. This electric grill does a very nice job of covering all ends of the temperature spectrum. It can handle low heat for big pieces of meat like a chicken breast, that takes a little while to fully cook in the middle, without burning the surface. At the same time, its highest heat setting does a nice job developing a sear on a steak or even crisping the skin on a ring sausage. If you want to make a perfectly medium rare steak, it might help to bench rest the steak for 20 minutes, by salting it and leaving it covered on the counter. This will let the internal temperature come up a little. You can then crank the electric grill to the max. Give it 10 minutes to fully preheat, then drop the steak and let it sear for four minutes with the lid closed. Then flip it to sear for two more minutes. The end result should be a perfectly pink middle with a nice flavorful crust. The lid on the searing grill also helps reduce the amount of smoke it puts out. Still, if you are making something that is fatty or has a lot of marinades, it might produce enough to smoke up the kitchen or even trip a nearby smoke detector. It might be best to use it near your oven hood, or close to an open window. There are one or two drawbacks to consider with this grill. 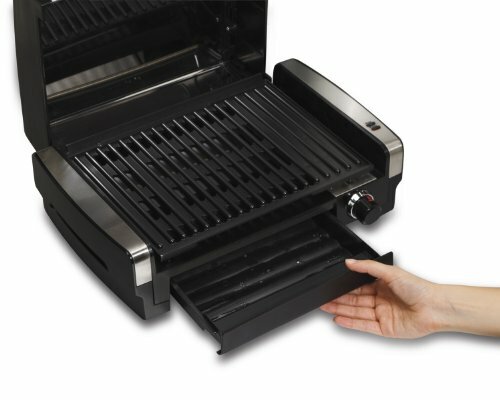 It isn’t a traditional clam-style electric grill, meaning you will need to occasionally flip the food being cooked. It also isn’t multi-functional like many of its competitors in the relatively same price point. It is a one surface contact grill, it can’t be used say as a fold-flat griddle. 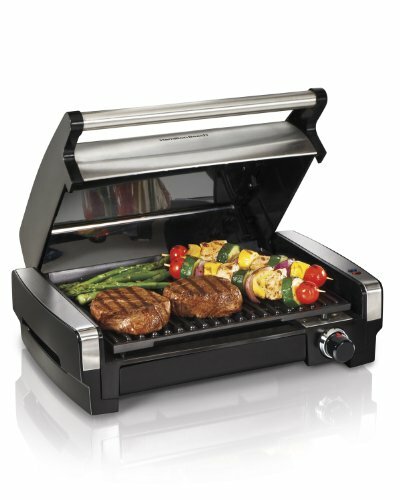 The Hamilton Beach Electric Indoor Searing Grill features a 118 square inch non-stick grilling surface. This should be enough to grill two New York Strip steaks if you pack them in tightly. With careful placement, you might also be able to grill three hamburger patties at a time. If you have to cook for more people than that, you may want to work in batches. Food that gets done early can be wrapped in heavy duty aluminum foil and placed in a warm oven. 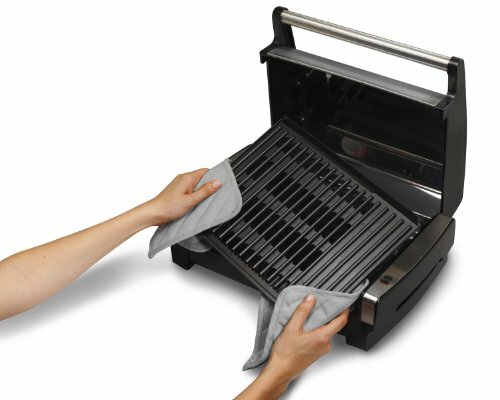 The Hamilton Beach 25360 Electric Indoor Searing Grill is generally much easier to clean than its competitors. The drip pan is large enough that it should never overflow in the middle of a cooking session. The drip pan, the primary cooking grate, and the lid all detach from the base, and they are dishwasher safe. Just be careful when loading the dishwasher to make sure that nothing can bump or scrape on the grill grates. Like a lot of nonstick surfaces, its easy to scratch and once damaged that area will cause food to stubbornly stick. If there’s a little spatter on the base or knob you can wipe them away with a nonabrasive sponge soaked with warm soapy water. Then dry with a clean paper towel. 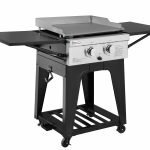 The Hamilton Beach Electric Indoor Searing Grill is warranted to be free from defects in material and workmanship for up to one year from the date of original purchase. Some online retailers will also offer three or even a four-year protection plan for a very affordable rate. 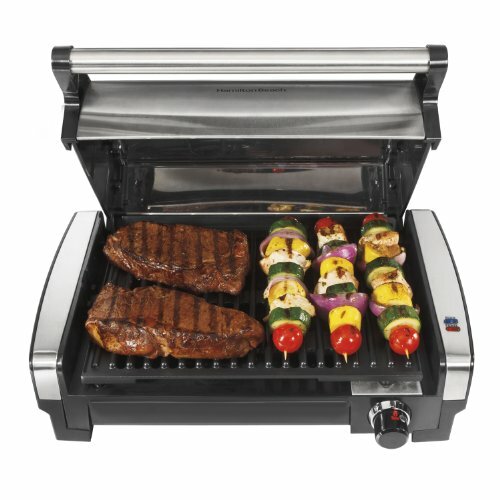 Electric grills come in a lot of different shapes and sizes. Finding the one that is right for you can take a little shopping around. The Hamilton Beach Electric Indoor Searing Grill provides nice heat and temperature range. It’s a snap to clean, and stores away easily. Unfortunately, it isn’t a multi-functional or even a clam-style grill. This means it is a bit of a one-trick-pony. Yet when you hold it up to other one trick pony electric grills, it does have higher quality components and it is much easier to clean.